VIDEO: Learn the basics of predicting the difficult airway with Dr. Peter Kas @ resus.com.au. REFERENCE: Review the basics of laryngeal anatomy via drawings and laryngoscopy images by Dr. Rich Levitan @ airwaycam.com. Treat all airways as potentially difficult. Use LEMON acronym. What is your back up airway plan? Have multiple options. Is bag mask ventilation going to be difficult? Does the patient need prep for surgical airway? Is your nasal cannula in place for apneic oxygenation? Is the patient pre-oxygenating appropriately with non-rebreather? Is the patient positioned appropriately (elevate head of bed!)? Does the patient have shunt physiology that requires NIV for pre-oxygenation? Is the patient non cooperative with pre-oxygenation? Do you need to consider DSI (Delayed-sequence intubation)? s there evidence of foreign body/trauma or fluid obstructing the airway? Do you have suction available at the bedside? s the head of the bed elevated? Does the patient respond to simple positioning maneuvers such as chin lift and jaw thrust? Will the patient tolerate an oral or nasal airway to assist with oxygenation? Is it easy to ventilate the patient? Do you need to consider alternate airway immediately such as extra-glottic device or surgical airway? Do you have nasal cannula in place for apneic oxygenation during BVM? Is a PEEP valve available? Do you have a good seal? Is there chest rise? Can you perform BVM with an assistant to improve oxygenation? Is the patient edentulous? Adjust mask positioning accordingly. Is the patient hemodynamically unstable, not oxygenating or severely acidotic? Can any of these be fixed before proceeding with laryngoscopy? What are your intubation meds? 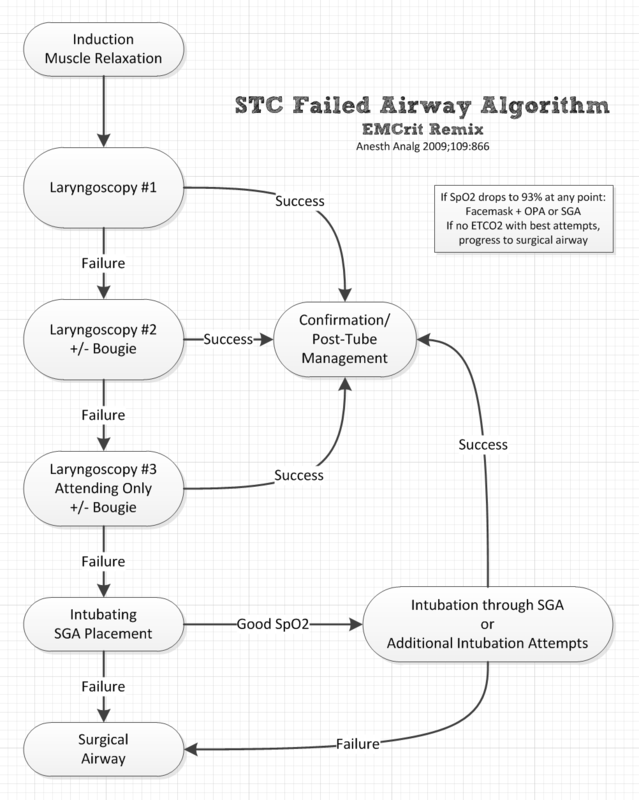 What is your plan for the airway if your first modality fails? (Verbalize) Are your alternate airway adjuncts set up and ready at bedside? Have you gone through your intubation checklist, whether written or mental? Are you psychologically prepared for the airway? Take your time.